The report provides detailed insights into the profiles of today’s Cross Platform Tool (CPT) users and how they use CP tools and services. The report also aggregates user profiles, usage behaviour and ratings for 14 leading CP Tools. 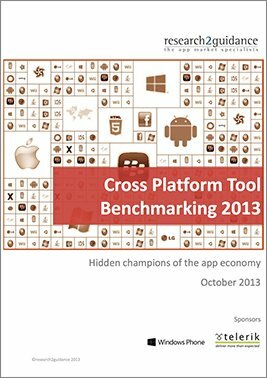 The report “Cross Platform Tools: User Profiles and Market Leader Benchmarking 2014” is based on the largest global study of cross platform app development with more than 2,100 participants and 150 CP Tools. The report is a unique source of information for any CPT vendor who wants to better understand who uses CP Tools, how to target users and which cooperation with which other tool vendors could be beneficial. CPT vendors can also get a detailed user feedback about their main competitors as well as about their own tool. In this way, CPT vendors could improve their marketing and sales activities or their service offerings. App developers and companies with an interest in cross-platform app development can use the detailed peer feedback about the 14 leading CP Tools to identify the best tool for their app project. Investors benefit by understanding the strengths and weaknesses of the leading CP Tools and the overall market readiness and potential.